Well, I'm rather sick of coding in my off hours now, but WordKeeperAlpha is pretty much fully functional and working for everyone, not just me. Just about the only thing lacking at this point is the tutorial… so … yeah. That's next on my to do list. Really though, now that its up and working I want to just take the rest of the year off of development and work on my book. That's actually the plan. I finished this version of WordKeeper, and I'm not going to be working on any more features until Impervious is done with its third draft. That means some features that I've been wanting to work on will have to wait, but thems the breaks. 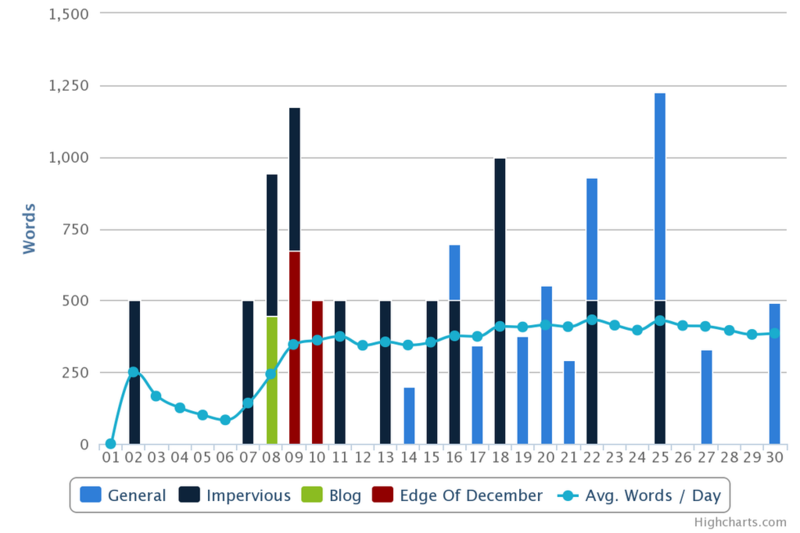 I've gone almost two months without writing so much as a word on Impervious, while coding on WordKeeper in almost every free minute. If I can devote half of the effort to Impervious that I gave to WordKeeper over the past couple of months, I'll have that book done and polished by the end of the year. As it is, WordKeeper is telling me to finish my 120,000 word goal by the end of the year, I'll need to be writing better than 800 words per day on it. Which is certainly doable…I just need to do it. Just a quick update for tonight. No pictures, no fancy deep thoughts. If you read this and you're interested in giving WordKeeper a try, head on over. If you'd like to keep up to date on the latest news, you can follow along on Twitter or my brand new Facebook page. I'll see you there.